The SunDreamTeam has already proven to be a popular casino game mainly due to the fact that its grand prize is the largest in the Fantasy Football game. During the 2008/2009 season, the Sun raised the prize money stake in the competition to a cool £1,000,000, which includes a huge £250,000 to the overall winner. With no restrictions as to how many players you can select to the team, it’s no surprise that the Sun has and is still drawing more and more multi-entrant fantasy managers. This means during the solo game; you might end up playing against managers who have a high number of teams. In other words, if you want to stand a chance of winning part of the £1,000,000 or walking away with the £250,000, you will have to invest heavily in the number of teams as well as dedicating your time and attention to the game. The most important factor that helps most of TheSunDreamTeam managers who have a huge number of teams is the transfer window. TheSunDreamTeam gives all the players two opportunities within which you have to make your transfer. This means that if you are a multi-errant manager, you will only be able to change your team twice per season as well as making only a maximum of 6 transfers over the season. This will make it very easy to run a different number of teams per season. At first glance, the SunDreamTeam seems pretty decent especially if you are looking to setup your private league. This limited number of transfers and transfer windows help limit the amount of change necessary throughout the season. Therefore, it’s logical only if you fancy coming up with a league where you and your mates aren’t keen on spending most of your time going through player lists and fixtures. However, chances are with the first transfer window, almost three months since the beginning of the season, most of the managers who shall have enrolled to your private league may give up especially if their teams have suffered injuries and are positioned at the bottom of the league. I think the Sun noticed this problem and devised the golden gamble feature which allows the managers to forego 3 weeks of points so that they can make changes in their team. How Do You Sign Up at the SunDreamTeam Website? Signing up with the website is simple. All that you have to do is follow the following steps. Visit the Suns dream team website. On the website, click on start to play button that is located on the home page. This will bring another field. Choose on the pick my team tab. 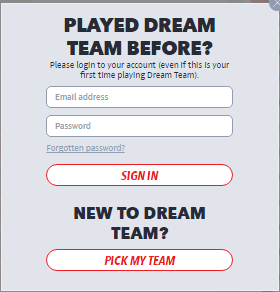 Selecting the “pick my team” option will bring to you another field that will require you to select players, add your team name as well as entering your email address. Once you are done providing the stated information, click on confirm team to start playing. You now have the chance of getting TheSunDreamTeam app without any charges from Google play market for Android users and Apple store for the iPhone and iPad users. Through TheSunDreamTeam app, you will be able to follow the competition as it proceeds throughout the season, in addition to winning cash prizes through the application. Unfortunately, you will be required to register your team on a Mac or PC as you cannot be able to register through the mobile application. If you sign up and create a league that has at least 10 people, you will be enrolled to the “chairman’s” league where you will have a chance of competing for the £10,000 cash prize. 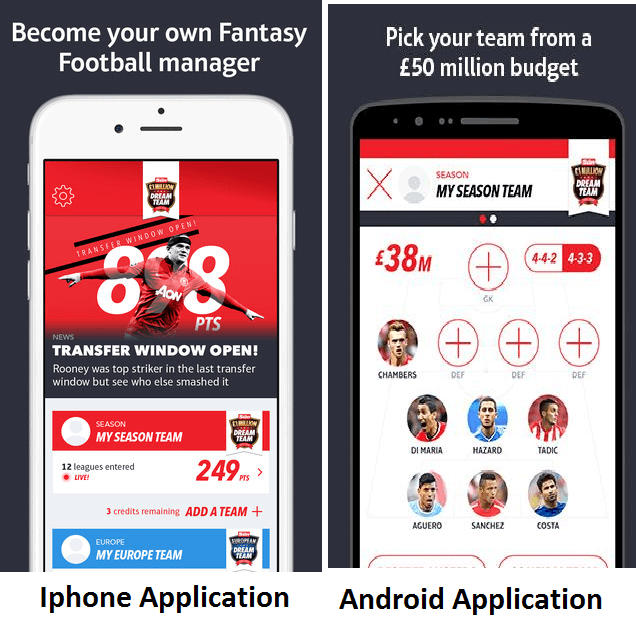 In TheSunDreamTeam 2015/2016 application, there were so many technological modifications that enable one to reset all the transfers you have made and make all your changes through your mobile. 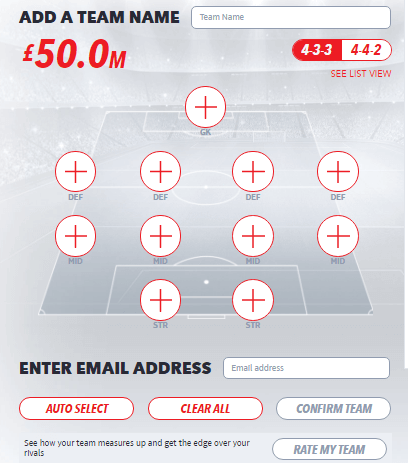 By effectively managing your team through the SunDreamTeam mobile applications, you stand a chance of winning the £5,000 that is usually offered weekly for the best performing team. You can also access and change your team's formation through the SunDreamTeam application before the start of every match. The 2015/2016 the SunDreamTeam app, there was a significant improvement from the earlier versions which only allowed you to see how your team was performing. TheSunDreamTeam app now operates under very good speeds even when most of the members are logged in to see how their teams are progressing as well as the scores. TheSunDreamTeam app underwent a massive overhaul in its overall design and usability. For instance, the applications’ design has been cleaned up, and it looks sharp. It also has focused on making navigation on the map easy for you to find the various tabs on your devices’ screen. You can still access the monthly prize of £500,000 by taking part in the activities and promotions that are on the website. 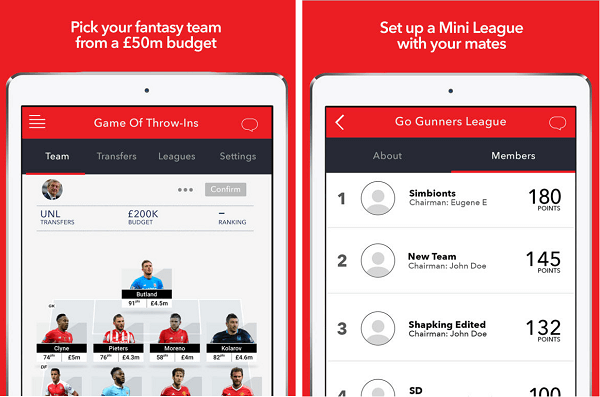 How Do You Install the SunDreamTeam App? To install the applications shown above, you will have to visit either the google play store the iTunes store. Download your application and run allow the google play store or iTunes to have access to your personal information to complete the installation process. Once you have installed the application and registered your team online, you can now log into your account and start managing your team. I am under the age of 18, can I participate in the SunDreamTeam competition? Unfortunately, you cannot participate in the competition. According to the UK laws, any competition involving money must ensure that only adults (18 years+) can participate in it. I live overseas, can I take part in the SunDreamTeam competition? No, you cannot participate in the competition. The SunDreamTeam competition is exclusive to players who live in the UK and Ireland. In fact, when you win any prize, you will be asked to provide proof of residence before you are paid. You will also be required to proof that you are 18 years and above before you are given your price.